Earn up to 42 Points Points. 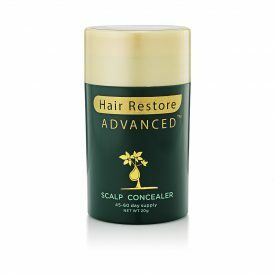 Hair Restore Advanced capsule formulation contains a blend of time- tested, tonic herbs that are widely used in Traditional Chinese and Ayurvedic medicine to help reduce hair loss, thinning hair, hair fall and the amount of greying hair. 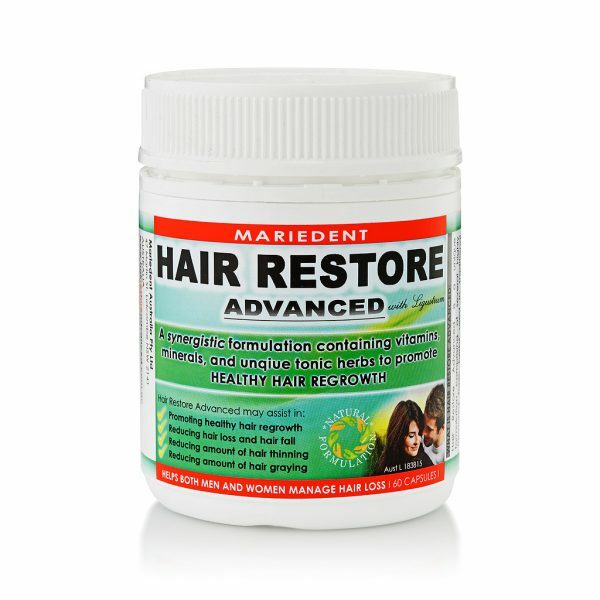 Hair Restore Advanced also contains essential minerals and vitamins for hair loss that provide nutrients to promote healthy hair regrowth. 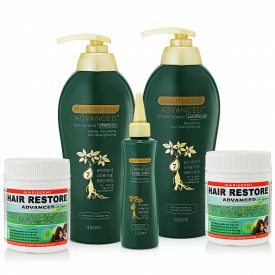 The active herbs within the Hair Restore Advanced capsule formulation have been shown in scientific studies to convert the hair follicles from the resting phase to the growth phase. The berries of the glossy privet tree, Ligustrum lucidum, have a long history of use in Traditional Chinese Herbal Medicine as a herb that helps “tonify the yin.” This expression cannot be fully explained without entering into the theoretical framework of Traditional Chinese Medicine, but it may be said loosely to indicate a strengthening effect on certain parts of the body, in particular the kidneys and liver. As part of herbal combinations (Traditional Chinese Herbal Medicine seldom uses single- herb preparations), Lucidum ligustrum fruit is used for such purposes as assisting in the management of ailments such as greying hair, hair loss, ringing in the ear, and treating vertigo. One of the most famous combination therapies containing Ligustrum lucidum is named Erzhi Wan, or the “Two- Solstices Pill.” Erzhi Wan is a two ingredient (er = two) formulation that is frequently mentioned in modern Chinese medical literature. 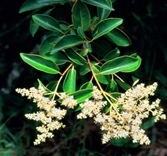 The pair of herbs- Ligustrum lucidum and Eclipta prostrata- are sometimes used as is, but more commonly they are incorporated into somewhat larger prescriptions. The formula name, which might be better translated as the “Two- Solstices Pill”, refers to when the herbs are routinely collected: each of the herbs are picked near the time of the solstice, the ultimate manifestation (zhi = furthest point) of the annual cycle of yin and yang. Specifically, Ligustrum lucidum is picked at the winter solstice (ultimate yin, the end of winter, before the weather warms) when its fruits are ripe, while Eclipta is picked at the summer solstice (ultimate yang, at the end of summer, before the weather cools) while in flower. The formula was recorded by Wang Ang in his 1682 A.D. publication Yifang Jijie (Collection of Medical Formulas). Wang remains a well- studied medical writer who emphasized the teachings of the Jin- Yuan medical reforms. 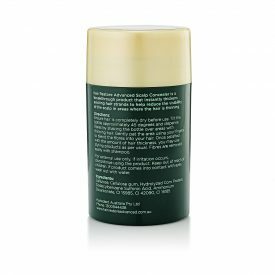 In this case, the formulation applies well to the School of Yin Nourishing, which held that yin always tended to be insufficient, especially with aging, so that it needed to be protected and restored. Erzhi Wan is a well- rounded formula that helps symptoms of yin- deficiency including hair loss and hair thinning. 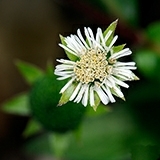 Commonly known as False Daisy, yerba de tago (Spanish), and bhringraj (sanskrit), Eclipta prostrata (also called Eclipta alba Hassk) is a plant belonging to the family Asteraceae which grows abundantly in the tropics and is used with success in Ayurvedic Medicine (one of the oldest and most renowned system of medicine). 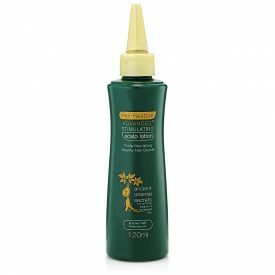 In Ayurvedic Medicine, Eclipta prostrata is one of the best known herb for balding and premature greying of hair due to its powerful liver tonifying activity. 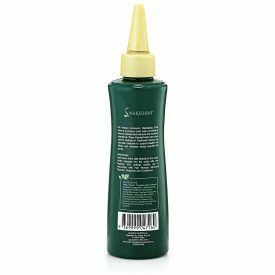 The Sanskrit word “bhringraj” literally means ‘King of Hair’ or ‘Ruler of Hair’, which refers to its reputation as a hair tonic. Eclipta prostrata (also known as Eclipta alba Hassk) is a well- known Ayurvedic herb with purported claims of hair growth promotion. 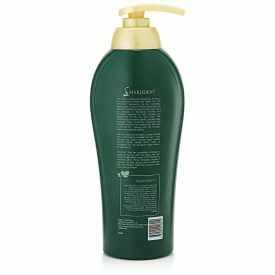 The extract of this herb and minoxidil 2% solution for comparison were applied on the shaved denuded skin of albino rats. 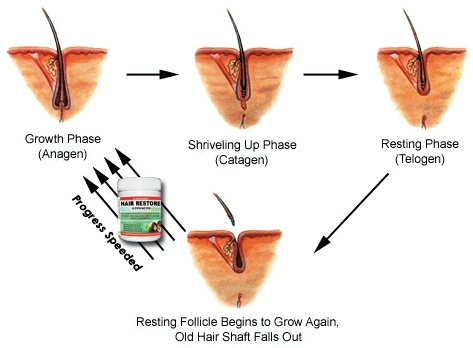 Results showed that hair growth initation time was significantly reduced to half, on treatment with the extracts, and quantitative analysis of hair growth exhibited a greater number of hair follicles in anagenic phase as compared to minoxidil (Reference: Roy RK, Thakur M, Dixit VK (2008). Hair growth- promoting activity of Eclipta alba in male albino rats. Arch Dermatol Res 300:357- 364). Extracted from textbook: Hair Restoration Surgery in Asians by Damkerng Pathomvanich, Kenichiro Imagawa, Pg 68. Published by Springer, 2010. 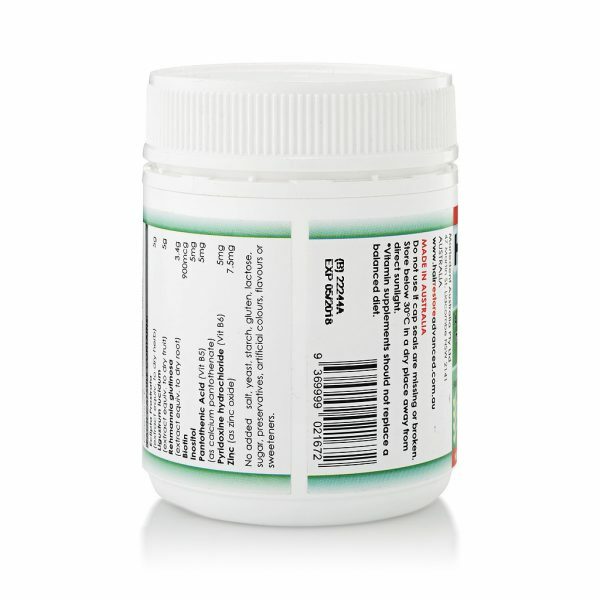 Rehmannia glutinosa is one of the 50 fundamental herbs used in Traditional Chinese Medicine. Rehmannia glutinosa is a perennial herb with reddish- violet flowers native to China, Japan and Korea. 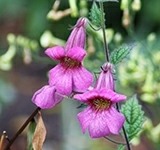 Its common name is Chinese Foxglove. Rehmannia glutinosa’s root is used medicinally in Oriental medicine to replenish vitality, to strengthen the liver, kidney and heart and for treatment of a variety of ailments. 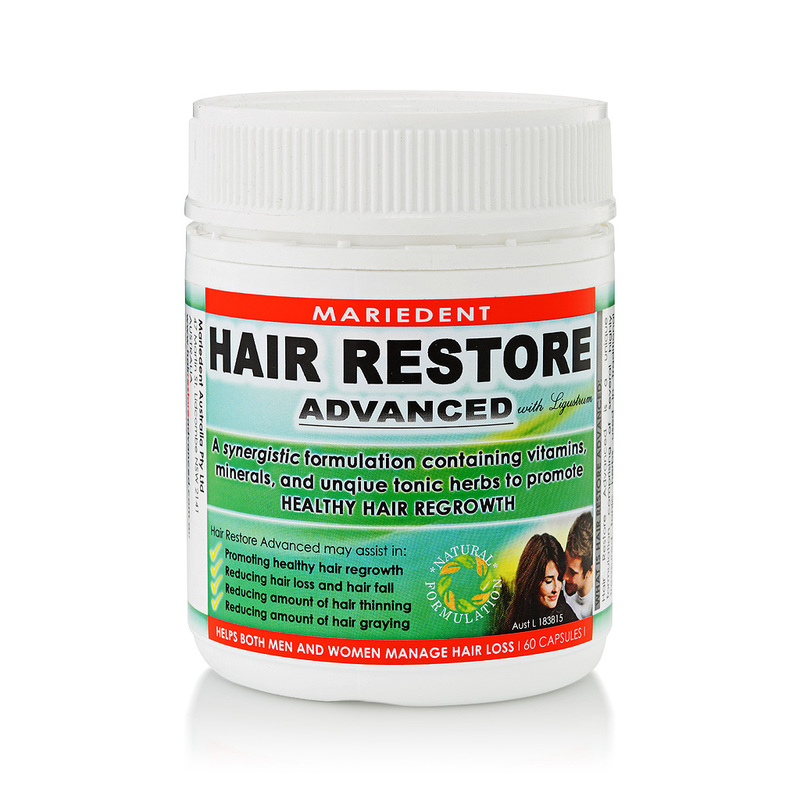 It is included in the Hair Restore Advanced formulation to enhance the synergistic effects of the main tonic herbs, Ligustrum lucidum and Eclipta prostrata. 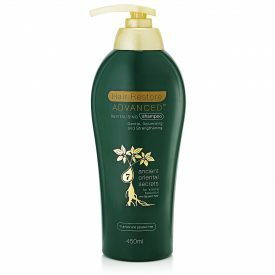 To nourish the hair and provide building blocks that enhance the actions of the specialised herbs are the vitamins and minerals contained in Hair Restore Advanced. 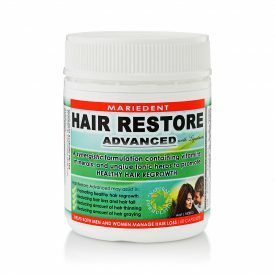 Hair Restore Advanced offers a unique combination of vitamins and minerals (including Biotin, Pantothenic acid (Vit B5), Inositol, Pyridoxine (Vit B6), and Zinc) that are scientifically proven aid the growth of healthy hair. 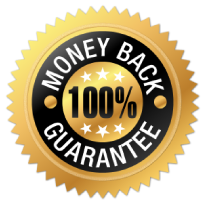 Take one capsule twice a day after food.